With a busy schedule I like to make different parts of Thanksgiving ahead of time and take them out of the freezer closer to the big Turkey Day, so I have less to do when it actually gets here. Dressing is one of the easiest things to make and freeze ahead of time, and I’ll tell you step-by-step how to do it. This is my Mamaw’s recipe she has been making for years. 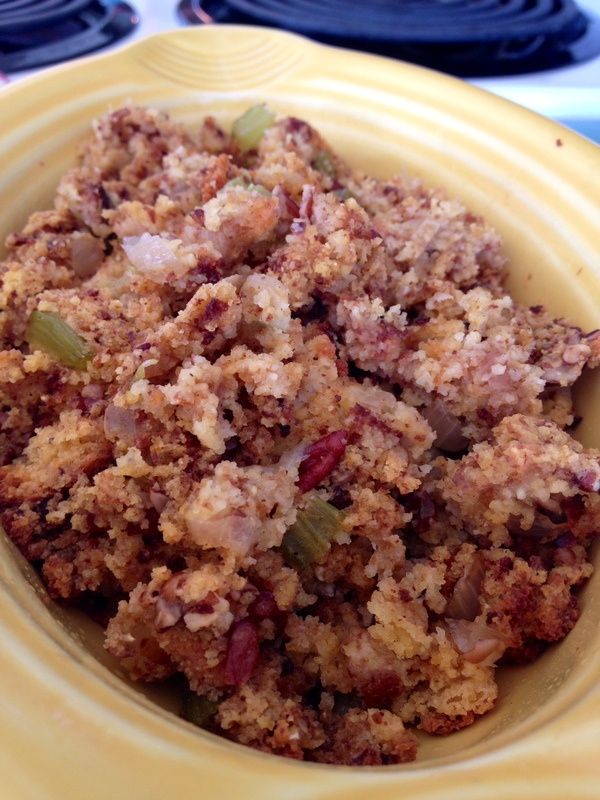 She combined her mother-in-law’s cornbread dressing recipe with another she found in the paper years ago and it is truly the yummiest dressing ever. Let’s get started! 1. 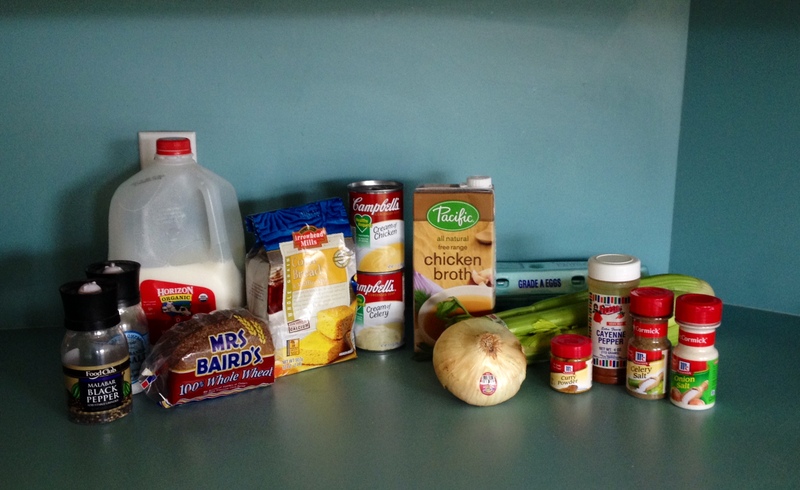 First get your cornbread mix going and bake as directed on the box/package. It takes about 30 minutes to get that cooked and another 5-10 to let it cool before handling it so you can get this started while you do everything else. Next, toast 5 pieces of bread so that all pieces are golden and crisp. Once the bread is done, break up with your hands into bread crumbs. It’s ok if they’re all different sizes. We’re in Texas and we’ll call it “rustic” 🙂 Set aside in large mixing bowl. 3. Once the veggies are getting closer to done, I like to put both soups and chicken broth in a microwave safe container and nuke it for about 40 seconds because I think it makes it easier to whisk them together. 4. 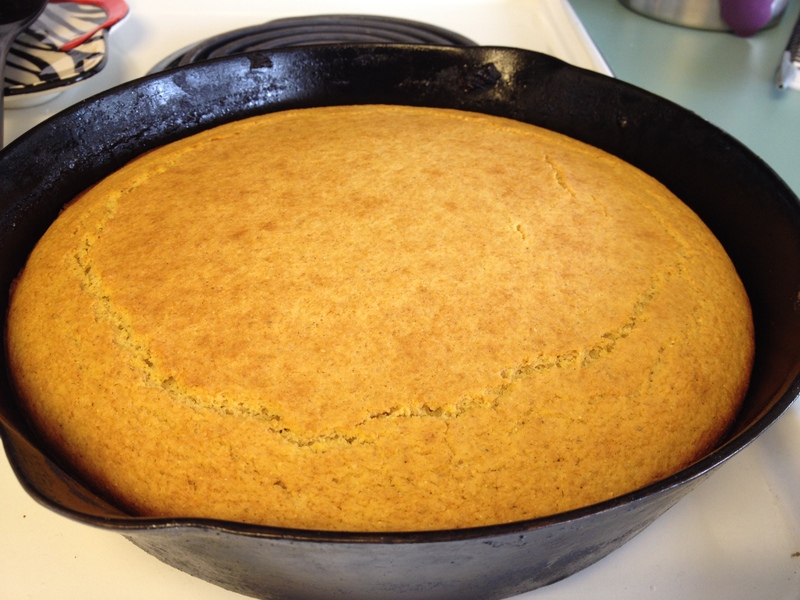 Is your cornbread done yet? You’ll want to get it out and let it cool for a few minutes before scraping it all out and dumping into the bread crumb mixture. Again, break the cornbread up with your hands into those beautiful rustic breadcrumbs. 5. 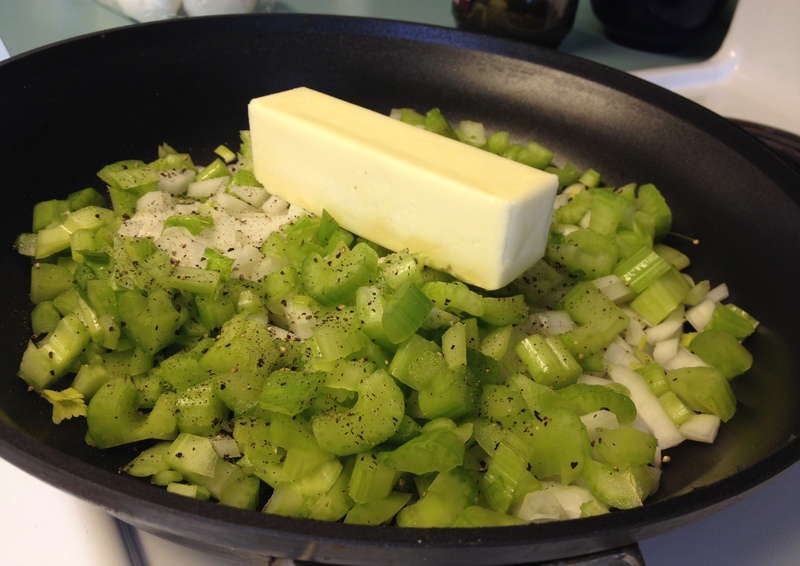 While your veggies are finishing up cooking go ahead and toast your chopped pecans. This only takes a few minutes and the moment you smell them, they are done. 6. Combine the veggies, soup/broth mix, chopped hard boiled eggs, and pecans all together in large mixing bowl with cornbread/breadcrumbs mixture. Now listen because THIS IS IMPORTANT!!! 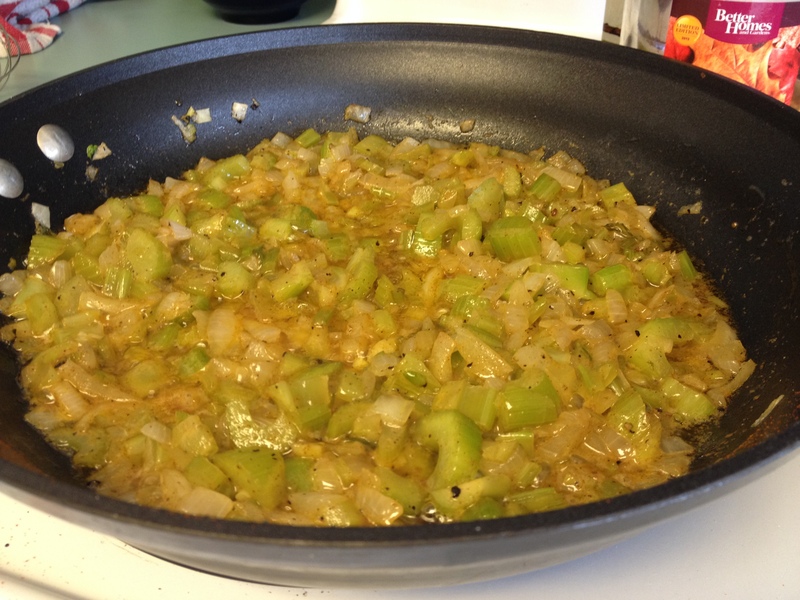 Do not stir this up too much, because it will cause the dressing to become dense instead of fluffy and delicious. Have you ever tasted someone’s dressing and the texture is similar to a fruit cake/door stop? That’s because they stirred it too much. 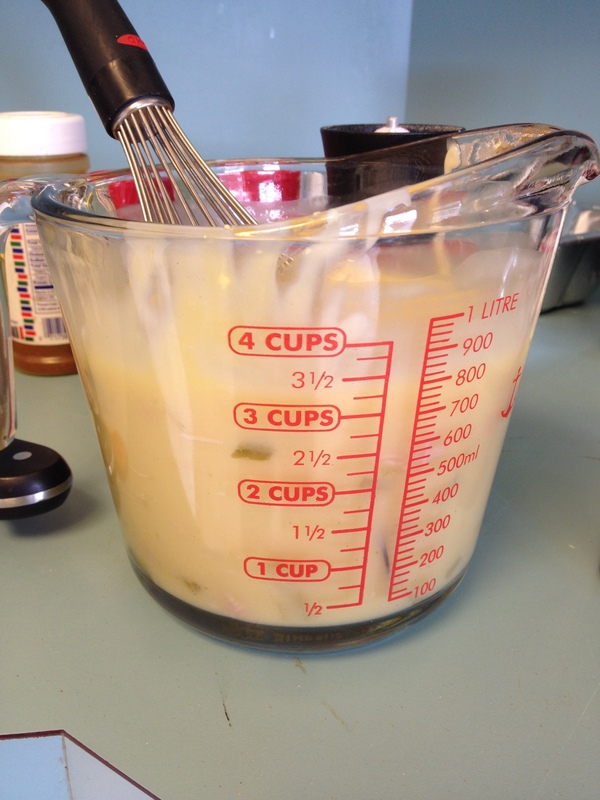 Stir just enough to combine and place in 9×11 buttered baking dish. Now, if you’re like me and going to freeze this before Thanksgiving, this is where you get out your plastic wrap and foil. First, wrap 1-2 layers of plastic wrap around baking dish and press plastic wrap onto dressing so that it is actually touching the top. Then finish with a layer of foil. The day before Thanksgiving you can take this out and place it in your fridge to defrost, then bake at 350F for 45 minutes. 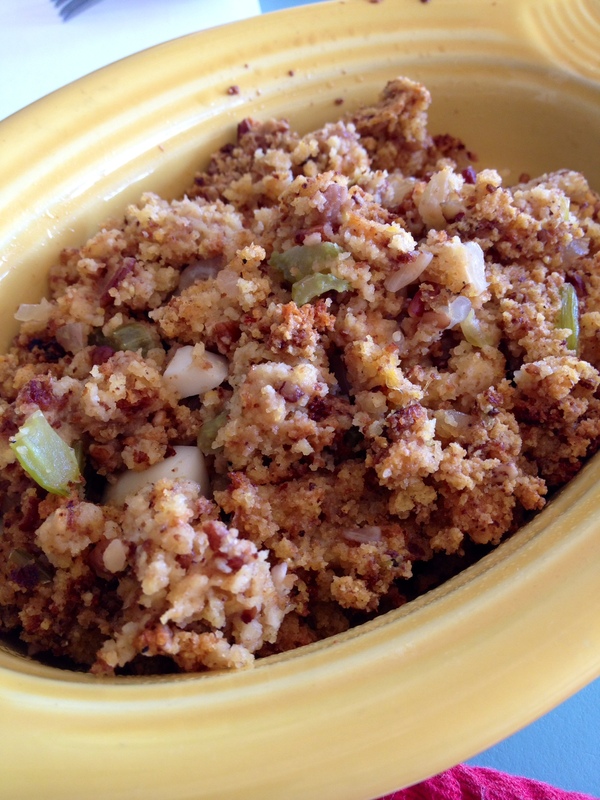 Otherwise, if you’re making it right now just cook as I just said and bask in the deliciousness that is Southern Cornbread Dressing. Go ahead and pour yourself a glass of wine, you’ve earned it tackling Turkey Day ahead of time!